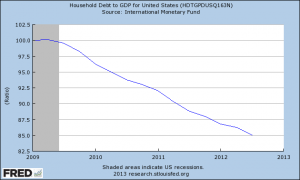 1/4 Americans Have More Credit Card Debt Than Savings – What Does That Really Mean? There’s an article making the rounds this week that makes Americans look like crap. Based on a recent survey, 24% of Americans have more credit card debt than assets held in emergency savings accounts. On the face of it, that looks really bad. 1/4 is a highly representative number and we all know credit card debt is bad. But I was thinking about how this was portrayed and whether this is just cherry-picking a ratio that looks really bad while to the contrary, things are actually improving. This shows not only the US moving in the right direction, but the ratio reaching levels not seen in over a decade! So, I wonder if this recent survey would have actually been 30% or even 40% just a few years ago and we’re actually trending positively? I know, you’re probably wondering what’s up. I’m usually quite pessimistic on the economy and the stupid things our politicians continue to do (anyone say sequester?). But the data is the data. And I try not to be guilty of confirmation bias. Just callin’ it like I see it. What’s Your Debt to Savings Ratio Look Like? 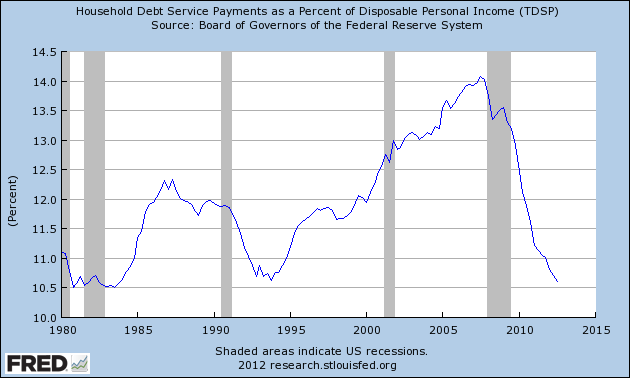 While debt is going down, I wonder about consumer savings. Is it just that people are paying off debt? I’m only curious, because a more robust economy could induce more spending and we’d be back where we were before. I have very little debt! Just a small mortgage and a car loan. It is in the low single digits! We carry no credit card debt, and use our cards strategically to earn cash back rewards on purchases we would make regardless. This has funded several new TVs and other items around the house, the money coming 100% from the rewards checks. The debt we carry consists of a mortgage and a small student loan. I’m in the camp that folks should get a $1 million dollar mortgage, if they can afford it and are in the top tax bracket. It’s just accounting and taking advantage of gov’t subsidies. It’s only the interest you’re writing off; and knowing Obama, he’ll eventually eliminate that for top earners. I wouldn’t buy an expensive mortgage when the rules are likely to change. Next post: Americans Spend Less and Less on Groceries Each Year. So Why Are We Broke?